Relax Sabres fans, the draft is nothing to fret over. After two years of having the ultimate, yet futile, goal of picking first, the Buffalo Sabres find themselves in a position they haven’t been in since 2013: picking outside the Top 5. In fact, the last time the Sabres didn’t pick second overall was when they drafted defenseman Rasmus Ristolainen with the 8th-overall selection – the same pick they hold in June — in 2013. 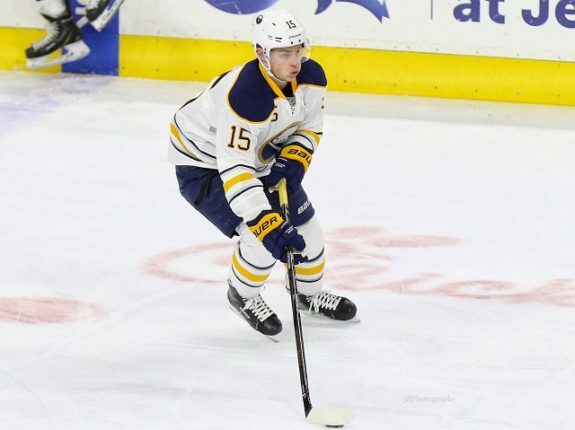 It was a move that has turned out great for the team as the young blue liner appears primed to become the number one defenseman the Sabres have been looking for. Now, in 2016, with the top two centers seemingly set for the future in Jack Eichel and Ryan O’Reilly, Buffalo is in a rare position for an organization that hasn’t made the playoffs since 2011. Instead of having a surefire need to address in the draft, general manager Tim Murray and company have the luxury of playing it safe and taking whomever they feel is the best player available. Some are sure to say that adding defense needs to be a priority with the pick, but Murray is more than likely going to address that via free agency or trade this offseason. After all, whomever they draft with the eighth pick isn’t going to make the roster this year so there really isn’t a need to go with need over overall talent. Brendan Guhle, Buffalo’s second-round last year, has progressed nicely, and could very well compete for a roster spot during training camp next season while forwards like Justin Bailey and Hudson Fasching should make a strong case for being in the lineup on opening night. Because of that, it gives Buffalo time to develop whomever they select at eight. And it’s not like there won’t be a plethora of highly skilled players available to choose from. From Pierre-Luc Dubois of Cape Breton to Alexander Nylander of Mississauga, Buffalo could have a potentially good to great player fall right to them while also having the luxury of not forcing them into the lineup right away. Even if they wanted to take a defenseman like Jakob Chychrun of Sarnia, they still wouldn’t have a need to play him immediately. It’s really a different feeling from the last two years where the team pretty much needed Eichel and Sam Reinhart, though the latter was sent to juniors shortly thereafter, in the lineup on opening night. This time around, Buffalo’s roster will be finalized via trades, free agency and players already in the system. And when you really think about it, there may be a risk of the eighth pick becoming a bit lost in the shuffle after the roster is finalized. A forward taken there, unless he shines in incredible ways during training camp, isn’t going to usurp players like Reinhart, Evander Kane, or Tyler Ennis from the top six. And it wouldn’t be too surprising if Murray makes a trade to acquire another scoring winger to add offensive firepower to a team that could use more. As far as defense goes, there may be more of an argument towards starting the pick in the NHL, but it’s not necessary. Five of the six spots appear set in stone barring a major roster move, giving the team one spot on the bottom pairing up for grabs. That’s more likely to go to a player like Guhle or a free agent signing as opposed to someone drafted this season. So, again, relax Sabres fans. It’s not a do-or-die draft for the organization. Don’t worry about whether the player they draft at eight will be able to play in the NHL right away because he’s not going to have to. It’s a strange position, but it’s one that Buffalo finds itself in.